Former President George H.W. Bush is interviewed for 'The Presidents’ Gatekeepers’ project about the White House chiefs of staff at the Bush Library on Oct. 24, 2011, in College Station, Texas. George H.W. Bush’s roots went deep in Connecticut. 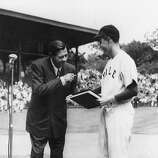 The former president, who died late Friday at the age of 94, moved to Greenwich as a baby. He grew up town, the second oldest of five siblings in a 1903 Victorian with a wraparound porch at 15 Grove Lane. Bush attended Greenwich Country Day School — arriving by limousine for classes. “The Town of Greenwich, like the nation and the world, mourns the loss of one of its own — a member of the ‘Greatest Generation,’” Tesei said in a statement. “President George H.W. Bush was a true hometown boy, that regardless of his position in the global sphere of political power, he remained forever tied to his family roots here in Greenwich. “President Bush was the epitome of selfless service to his country. His modesty, his genuine and dignified character served him well as the consummate patriot, statesman and president. His steadfast demeanor established the high standard of conduct for those who hold our Nation’s highest office,” Tesei said. Greenwich is the place where Bush met his wife, Barbara, who was from neighboring Harrison, N.Y. The two shared a dance at a Christmas Party at the Round Hill Club in town. He was 18 or 19, she was 16. The marriage, which lasted for 73 years until her death at age 92 in April, produced six children. The oldest: former President George W. Bush, who was born in New Haven while his father was a student at Yale. “Yale has lost a loyal friend,” Yale University President Peter Salovey said in a statement Saturday morning. “Throughout his lifetime, President Bush exemplified the values of service and leadership we seek to foster at Yale. A decorated veteran, he spent three years as a naval aviator flying combat missions over the Pacific before entering Yale. Gov Dannel Malloy directed that all U.S. and state flags in Connecticut be lowered to half-staff for 30 days in remembrance of Bush. “President George H.W. 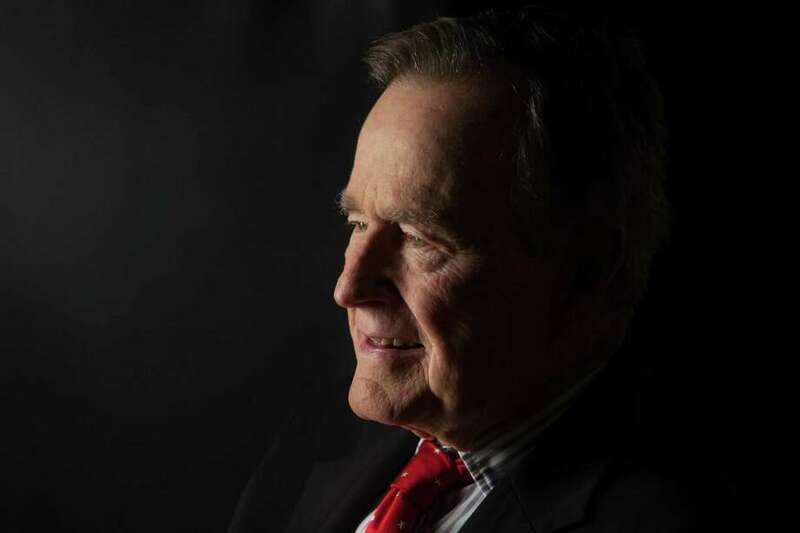 Bush was not only the leader of our nation during a time of transition in a post-Cold War world, but he was also a son of Connecticut, a war hero, a baseball enthusiast, and a dedicated and selfless public servant,” Malloy said. “His commitment to serve this nation when called upon in numerous ways — as an aviator, a congressman, the head of the CIA, vice president, and as president and commander-in-chief — illustrated his undying love of country. Especially at this time as we mourn his loss, all of us as Americans should take a moment to reflect on the diplomatic ways that President Bush lived his life and the example he set for our nation, particularly in the years following his service in the White House. Former Chief State’s Attorney Christopher Morano, whose dad, the late state Sen. Michael L. Morano, R-Greenwich, was close friends with Bush, recalled Saturday that the two shared the Greenwich connection, but also a lifelong devotion to helping people. “They shared one thing: the genteel ability to cross the (political party) aisle, they both shared that,” said Morano, who grew up in Greenwich but now lives and practices law in Essex. Morano said that his father, who served in the General Assembly for nearly 30 years and was known as “the beloved one,” stayed in touch with Bush, through notes and phone calls. Russell Reynolds Jr. of Greenwich served as Bush’s campaign finance manager in Connecticut and was an old friend. Reynolds visited with Barbara and George H.W. Bush when he was vice president and they were living at the Naval Observatory in Washington D.C, and came away impressed with their lack of pretense — “real people,” he called them. Bush was the kind of leader the country was fortunate to have, Reynolds said. “It was a privilege working for him. Really smart, and tough when he needed to be,” he recalled. E. Pendleton James, a longtime staff member for President Ronald Reagan, said Bush was a major asset to the Reagan administration. 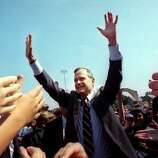 Bush was also a kind and considerate friend, James said. When James was moving his family from California to Washington, Bush made an extra effort to help the family find their way in an unfamiliar city. U.S. Sen. Richard Blumenthal (D-Conn.), who also lives in Greenwich, recalled Bush’s long service to the nation. State Rep. Fred Camillo, R-Greenwich, paid tribute to Bush’s service to the country, something that went far beyond politics. State. Sen. L Scott Frantz, R-Greenwich, praised Bush’s public service. Danbury Mayor Mark Boughton took to Twitter to remember Bush. “A great man. And a great president. Met him twice. Sent my father a beautiful note in the 70s - he never forgot. History will be kind to him,” Boughton said. Ansonia Mayor Dave Cassetti, who met Bush and talked to him for a minute or so in 1992, has fond memories of that experience — and of Bush’s presidency. “He was the most qualified man to hold the position of president — I mean, he was ambassador to China, he was director of the CIA, he was vice president,” Casseti said. “I’m saddened to hear that he passed, but at least I got to see him and talk to him — and I’ve got the picture to prove it,” said Cassetti. Bush, who was president at the time, spoke in Warsaw Park in Ansonia, said Cassetti, who was a construction contractor back then. “He looked at me and came up to me. I gave him a shirt and a hat from my business,” said Cassetti. “Somebody snapped a picture and it appeared in the Waterbury Republican. He remembered Bush as “a very nice man, very easy going, very polite. He thanked me for the shirt and hat,” which bore the insignia of Cassetti’s Birmingham Construction, he said. Lt. Gov. Nancy Wyman also mourned Bush, who is remembered as a favorite son in the Nutmeg State. Ken Borsuk, Robert Marchant, Helen Bennett and Mark Zaretsky contributed to this story.